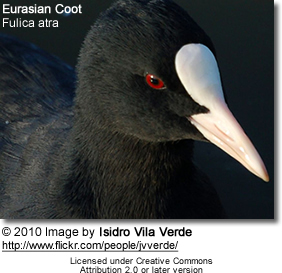 The Eurasian Coot, Fulica atra, also known as Coot, is a member of the rail and crake bird family, the Rallidae. 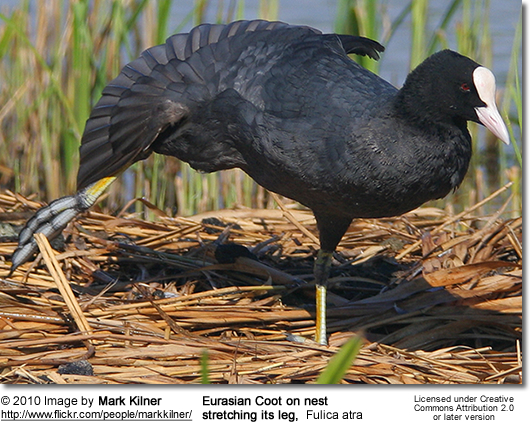 The Australian subspecies is known as the Australian Coot. 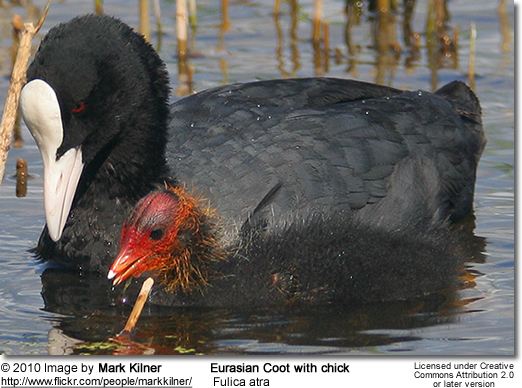 The Coot breeds across much of the Old World on freshwater lakes and ponds. 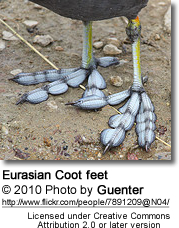 It occurs and breeds in Europe, Asia, Australia, and Africa. The species has recently expanded its range into New Zealand. 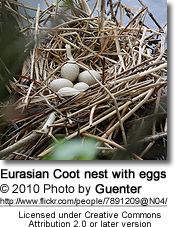 It is resident in the milder parts of its range, but migrates further south and west from much of Asia in winter as the waters freeze. 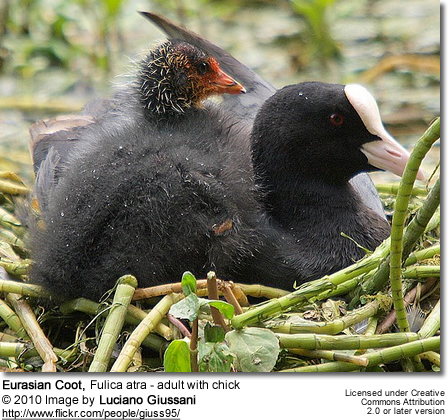 The Coot is 36–42 cm long, and is largely black except for the white facial shield (which gave rise to the phrase "as bald as a coot", which the Oxford English Dictionary cites in use as early as 1430). 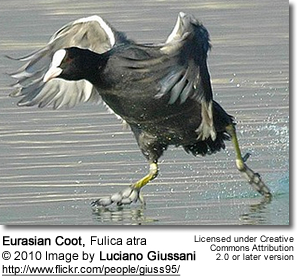 As a swimming species, the Coot has partial webbing on its long strong toes. 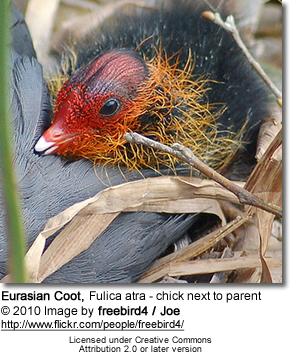 The juvenile is paler than the adult, has a whitish breast, and lacks the facial shield; the adult black plumage develops when about 3–4 months old, but the white shield is only fully developed at about one year old. 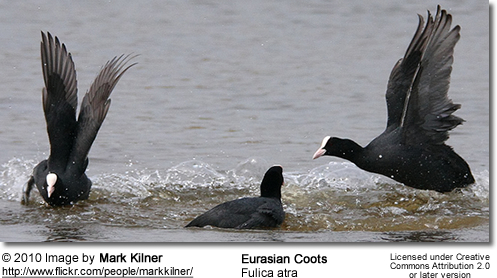 The Coot is much less secretive than most of the rail family, and can be seen swimming on open water or walking across waterside grasslands. It is an aggressive species, and strongly territorial during the breeding season, and both parents are involved in territorial defence. 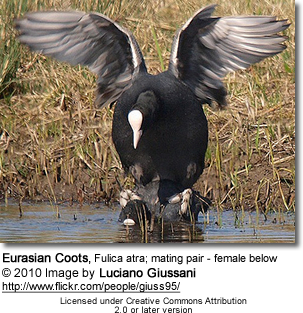 During the non-breeding season they may form large flocks, possibly related to predator avoidance. It is reluctant to fly and when taking off runs across the water surface with much splashing. 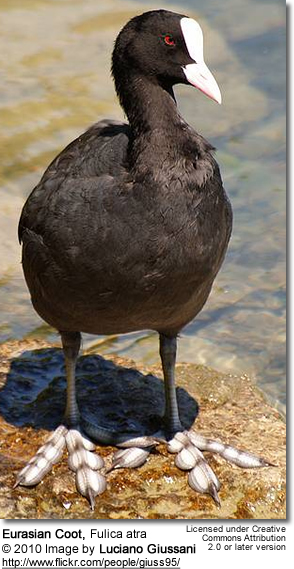 They do the same, but without actually flying, when travelling a short distance at speed in territorial disputes. As with many rails, its weak flight does not inspire confidence, but on migration, usually at night, it can cover surprisingly large distances. It bobs its head as it swims, and makes short dives from a little jump.